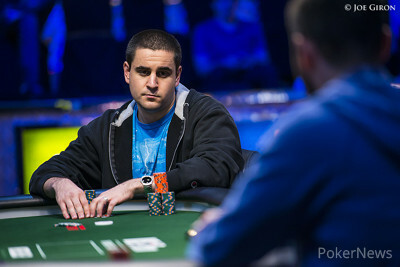 The official table of nine was underway and before the end of the next level Michael Sortino would fall in 9th place when Ylon Schwartz's out flopped his . 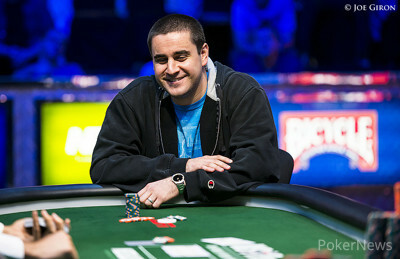 Ken Weinstein exited in 10th when his short stack shove with was looked up by the of Jeremy Dresch. The story of quite a long session of three handed play was Paster's refusal to give up and a series of double ups where he got it in with the worst hand but came up smelling of roses each time. On level four, when they were four handed, he got it in with and was at risk against the of Dizenzo but a straight on the board saved him. He then doubled up minutes later with against the of Cartwright when the board ran out . He then slipped back a fair bit before getting it all in with against Cartwright again, and again the dealer came to the rescue, this time on the river as the cards fell . It looked for a long time that it would come down to a battle between Cartwright and Schwartz, but it was not to be. A quick dinner break was then declared and they came back to play with Cartwright holding the lead with 4,605,000 against the 2,025,000 of Paster. Indeed it didn't take long after resumption of play for a winner to be decided. Cartwright's rail yelled and now he had to anxiously fade a four or two runners. The turn was the and the river must have seemed to take forever for Cartwright and Paster, but eventually came the . Paster got out of the way and Cartwright thought for a moment before eventually making the call with . We could see the disappointment on Schwartz's face as he rolled over . Ylon Schwartz raised to 100,000 from the button and Jason Paster reraised to 250,000 from the small blind. Cartwright folded from the big blind and Schwartz four-bet to 525,000. Paster moved all in and Schwartz folded. Hand #139 Ylon Schwartz limped in the small blind and Jason Paster checked in the big blind. The flop was . A bet from Schwartz took it down. Hand #140 Paster limped in the small blind and Cartwright made it 140,000 from the big blind. Paster responded by moving all in and Cartwright folded. Hand #141 Cartwright opened on the button and Schwartz responded with a three-bet from the small blind. That saw him win the pot. Hand #142 Cartwright got another walk. Hand #143 Paster made it 100,000 from the button and the blinds both folded. Hand #144 Cartwright made it 100,000 from the button and Paster made the call from the big blind. The flop was . Paster cheked and Cartwright bet 90,000. Paster made the call to see the turn which both players checked. A river card saw Paster lead for 180,000 and Cartwright made the fold. Kyle Cartwright raised to 100,000 from the button and both opponents folded. Ylon Schwartz raised to 100,000 from the button, Paster folded and Cartwright reraised to 290,000 and Schwartz folded. Jason Paster raised all in from the button for 595,000 and Schwartz called from the big blind. Paster had the and Schwartz tabled . Paster needed help to stay alive and received it on a flop of . The board ran out and Paster's small two pair held for the double. Hand #131 Ylon Schwartz opened for 105,000 and added the antes and blinds to his stack. 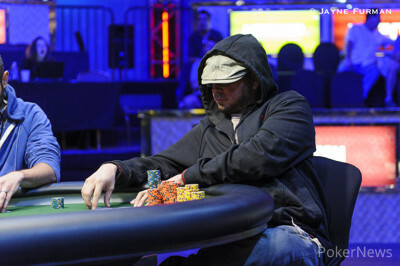 Hand #132 Kyle Cartwright raised to 110,000 from the small blind and Schwartz called. The flop was . A check from Cartwright saw a 60,000 bet from Schwartz and the pot was his. Hand #133 Kyle Cartwright opened for 100,000 on the button and took it down. Hand #134 Kyle Cartwright got a walk. 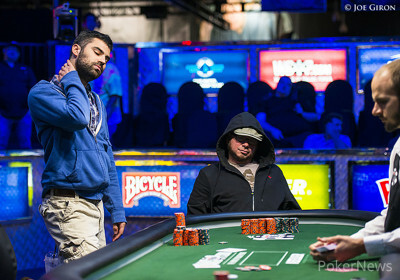 Hand #135 Jason Paster moved all in for 595,000 and neither of the other players wanted to look him up. Hand #128 Kyle Cartwright got a walk. 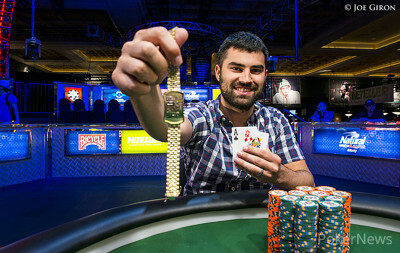 Hand #129 Jason Paster opened for 80,000, Kyle Cartwright three-bet to 170,000. Fold from Ylon Schwartz in the big blind and Paster let it go. Hand #130 Schwartz raised and took it down. Ylon Schwartz received a walk. Kyle Cartwright raised to 80,000 from the button, Schwartz folded and Jason Paster called from the big blind. The flop came down and Paster checked. Cartwright bet 55,000 and Paster called. The turn was the and Paster checked. Cartwright bet 165,000 and Paster folded. Ylon Schwartz raised to 80,000 from the button and both opponents folded. Paster folded, Kyle Cartwright raised to 90,000 from the small blind and Ylon Schwartz made the call. The flop was and Cartwright bet 65,000 and Schwartz folded. Kyle Cartwright raised to 80,000 from the button and both opponents folded. Hand #118 Kyle Cartwright made it 80,000 from the button and won the blinds and antes. Hand #119 Cartwright got a walk. Hand #120 Jason Paster moved all in again, but no callers. Hand #121 Ylon Schwartz made it 80,000 and won the hand. Hand #122 Schwartz made it 80,000 on the button, Paster moved all in for 520,000 and Cartwright got out of the way. Schwartz looked him over for a while and chuckled. He weighed it up for a while longer and made the call. Paster showed and was against the of Schwartz. The cards ran out and Paster had another double up. "Teflon" shouted someone on the rail. Hand #117 Jason Paster moved all in from the button for 495,000. The other players fold. Kyle Cartwright raised from the button to 80,000 and both opponents folded. Schwartz folded, Jason Paster moved all in from the small blind and Cartwright folded. Paster folded, Kyle Cartwright raised to 90,000 from the small blind and Schwartz folded. Kyle Cartwright raised to 80,000 from the button and both players folded. 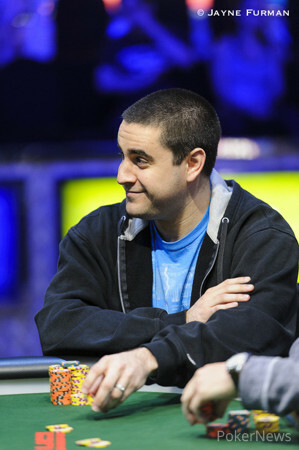 Ylon Schwartz raised to 80,000 from the button and both players folded. Hand #107 Ylon Schwartz raised from the button to 80,000. Folds from small blind Jason Paster and big blind Kyle Cartwright. Hand #108 Head up to a flop of . Cartwright was first to act and a 65,000 bet was good. Hand #109 Jason Paster got a walk. Hand #110 Paster limped the small blind and Cartwright called. They saw a flop of . Paster was first to act and bet 40,000. Cartwright called to see a on the turn. Paster bet 85,000 and Cartwright now raised to 190,000. Paster sat blinking, lost in thought before calling. The river card was the . A check from Paster saw Cartwright move all in. Now Paster took a long time to think before making the fold. Jason Paster raised to 80,000 from the button and Kyle Cartwright reraised to 140,000 from the small blind. Schwartz and Paster both folded. Kyle Cartwright raised to 80,000 from the button and Ylon Schwartz reraised to 195,000 from the small blind. Paster folded and Cartwright made the call. The flop came down and Schwartz led for 115,000. Cartwright called and the turn was the . Schwartz checked and Cartwright also checked. The river was the and Schwartz bet 310,00 and Cartwright quickly called. Schwartz showed for two pair and Cartwright mucked his cards.